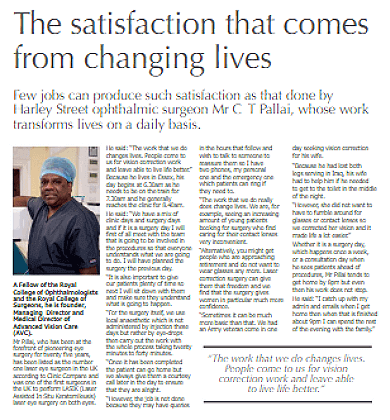 Dr CT Pillai, Medical Director at Advanced Vision Care, was recently interviewed by Southwark Business Today. A pioneer of laser eye surgery for over 25 years, Dr Pillai is now widely recognised as the NUMBER ONE laser eye surgeon working in the UK today, according to Clinic Compare. Even after a lifetime dedicated to helping people see better, Dr Pillai’s day is a long one. Starting at 6.30 am, his day is packed full of consultations, surgery, follow-ups and the day-to-day management of his leading eye clinic Advanced Vision Care, based in prestigious Harley Street in the heart of London. Add to that the inevitable slog that is commuting in London and the admin requirements that every business leader has to endure and his day draws to close at around 9 pm when he finally gets to spend some time with his family. A laser eye surgeon’s day is most definitely a long one. Laser eye surgery – both LASIK and LASEK – have really taken off in the UK in recent years. Increasingly, AVC is treating more and more young patients who want to live a life free of glasses and contact lenses, which they find an inconvenience to manage to say the least. But it’s not just the young that are looking for laser correction treatment. People approaching retirement and beyond, who are fed up with the daily rituals that come with wearing glasses and contact lenses, want the freedom and confidence that vision correction can bring. But sometimes, it’s much more fundamental but transforming than that. AVC treated an Iraq war veteran who had lost both legs whilst serving in the Middle East. As a result of his injuries, his wife had to frequently help him to go to toilet in the middle of the night. She found this task more difficult than it needed to be because she was forever fumbling around in the dark searching for her glasses. Post surgery at AVC and her life has been made a whole lot easier. Advanced Vision Care is already world renowned for our elite laser eye surgeons and cutting edge technology. However, as a leading eye clinic, we provide a range of vision correction treatments including implantable contact lenses, Refractive Lens Exchange/Lens Replacement, private cataract surgery and several treatments for the eye condition keratoconus. Whatever your prescription or personal requirements, AVC has a vision correction treatment for you. And that comes with the stamp of quality you would expect from a clinic on Harley Street.